Lavender prefers lots of sun but will tolerate a limited amount of shade. Well-drained soil is essential, otherwise the foliage will yellow. The soil pH should be close to neutral, or slightly alkaline. Add lime if your soil pH is more than slightly acid. 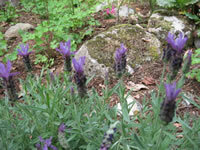 Lavender plants should be pruned back immediately after blooming to keep the plant compact and neat. Older, woody plants can be cut back half way when new growth begins in spring if they are in need of rejuvenation, or to remove growth killed over the winter. Lavender plants should be divided in the fall if needed. Lavender plants tolerate drought quite well, but water them a bit through really dry periods, preferably not over their foliage. Fertilize Lavender Plants sparingly if at all, because these plants are not particularly hungry.